The way we shop is constantly evolving. You may not realize it, but retailers are always looking for ways to draw in new shoppers, retain their customer base and boost their bottom line. 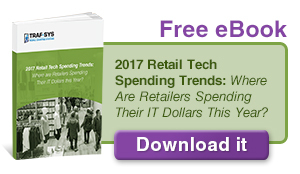 Through the years, we’ve seen retail technology change and shape the way we purchase everything, from cars, to groceries, to clothing. Cash registers were introduced for the first time in the 1800s, and in the 1940s, credit cards made their debut. The barcode, which most of us pay little attention to, was first used in the 1970s to help automate the checkout in grocery stores. The technology was so successful it spread to nearly every other facet of retail. The 1990s ushered in the era of online shopping and in the last decade, we’ve seen e-commerce boom and give rise to the omnichannel experience. Virtual reality simulations allow executives to test store campaigns and displays, and receive feedback on their potential success. Augmented reality features give cosmetic lovers the opportunity to virtually “try on” different shades of eye shadow or lipstick before purchasing. Voice-assisted shopping with virtual assistants is likely to become a popular method of purchasing products. Self-checkouts provide customers convenience to tech-savvy shoppers who prefer to avoid long lines. New smart dressing rooms enable shoppers to browse through stores and have items they select through apps readily available for them to try on. 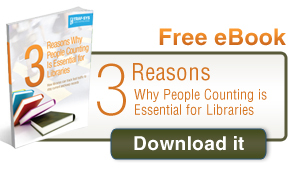 One of the most important systems to evolve with the times is people counting technology. According to a blog posted by the Control Group, people counting technology was born in 1970 when a Canadian engineer outfitted a large box the size of a refrigerator with an infrared beam that would count every time someone walked across it. Since then, people counting has advanced from a rudimentary way to count people who walked across a beam to a sophisticated system of analytics that helps retailers better understand consumer behavior. Today’s people counters come in a variety of options that take into consideration a store’s physical factors and can be customized for your exact needs. A big step up from the refrigerator box setup of the 1970s, horizontal people counters are door-mounted systems that come in both wired and wireless options. These systems follow a similar process that the first people counting solutions used decades ago, but have been upgraded to be far less bulky and much more efficient. Mounted on doors, these sensors cast horizontal infrared beams across the doorway to count the number of people who “break” the beam by crossing the threshold. These horizontal people counters offer many benefits, since they are less expensive and quick to install. Wireless options contain lithium batteries that can power these systems for over a year without needing to be replaced. Horizontal systems are good for retailers who are new to people counting solutions and are just starting to test the waters to see what they can do with the information they provide. Independent boutiques, single-door gift shops, and smaller retail locations have found great success using horizontal people counting solutions, however. These systems offer solid basic data on overall foot traffic, and can reveal which times of day or which days of the week generate more food traffic than others. Business owners have been able to use data from horizontal solutions to adjust their staffing levels so they have the right personnel on hand based on their needs. While convenient, horizontal systems do have their limits. These people counters only count an interruption in the infrared beam as one person, which means they can produce false readings if doorways are wide enough for more than one person to enter at a time, or traffic flow is heavy during peak business hours. Because of this, they aren’t ideal for businesses with wider doorways or high foot traffic. Additionally, they aren’t able to read the differences between adults and children or service animals, so for businesses that would benefit from more than just a head count, they may not be the best choice. 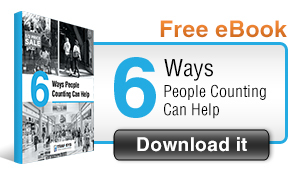 While horizontal people counting solutions are an asset for small businesses, many have graduated from these to more advance systems as they expand their business. 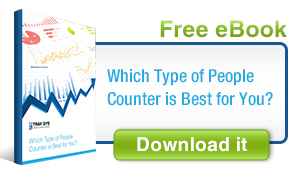 Overhead people counters offer more accuracy and better data than horizontal counters, as they can report on more than just how many people are entering a building. When placed strategically, these solutions can register which areas of a business people go to once they’ve entered, and what zones are the most popular with customers or visitors. Generally, these systems are comprised of sensors that are mounted on the ceiling, which feed data into analytics software. 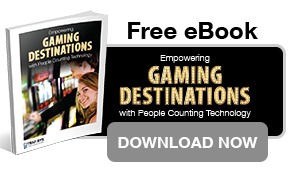 The data garnered from these people counting solutions can help business owners map customer traffic across different areas, determine optimal staffing and schedules, and highlight which areas serve as the best placement for featured promotional items. There are two major types of overhead people counters: thermal and video-based. Thermal overhead sensors utilize body heat to determine the number of customers moving through a building. Highly efficient, they can work in all types of lighting, and have an overall accuracy rate of 95% or higher. These sensors gather multi-directional data in regards to customer movements in and out of a building. They allow multiple people to be counted at the same time, so they are perfect for businesses with wider entrances or double doors. Similar to the horizontal counters, thermal people counting systems can be wireless, but unlike the aforementioned system, the ranges of thermal sensors can be extended to fit almost any layout or building size with the use of repeaters. 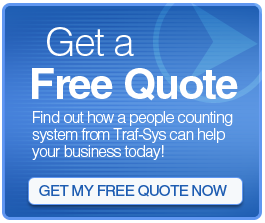 A potential downside of these systems is the price, making them less ideal for small business owners that may have a limited budget to invest in people counting technology. The enhanced functionality also means a higher initial cost, and because of the motion-capture sensors, they depend on the movement of customers to be able to pick up their signal. Additionally, extreme heat or cold can affect the accuracy of these systems, and compared to the best video-based people counting systems, they offer less resolution and a lower field of vision. This means that they aren’t as accurate when distinguishing between adults and children. Video-based sensors are mounted on the ceiling as well, but instead of reading heat signatures, they use video to provide data on customer traffic. Because of this, they can easily differentiate between adults, children, and service animals, and can give detailed data about who is entering your business. An advantage of video-based overhead sensors is the ability to handle wide areas with the use of multiple units. Business owners also have the ability to easily upgrade the software, and adjust the systems to changes in lighting and temperature. Video-based people counting solutions can filter carts, children, and strollers so that businesses have a more accurate count of actual shoppers with purchasing power instead of the total number of people in the store. If the power were to go out, these systems are equipped with a flash memory that can store up to ten days’ worth of data. Unfortunately, these systems also require stores to be evenly and well lit, since shadows and varying light levels can affect the overall accuracy. Because each system has advantages and disadvantages, many businesses opt for combined thermal and video-based people counting solutions for detailed and accurate data in all scenarios. These can be streamed simultaneously through a web browser, so the data can be compared between the two sensors for the most accurate readings. 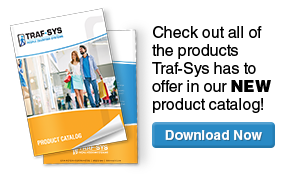 Foot traffic data allows retailers to determine how effective their advertising campaigns and store promotions are. Retailers can track the success of these promotions by assessing the amount of traffic and sales during the promotional period and comparing it to normal business operations and previous promotions. Rather than looking at just the sales data, foot traffic data from people counting systems allows retailers to improve advertisements and help turn browsers into buyers. A major advantage that brick-and-mortar stores have that online stores don’t have is the element of in-person customer service. By comparing customers who browse and those who make purchases over time, retailers can determine what steps they need to take to improve in-store customer service and engagement, and increase brand loyalty. 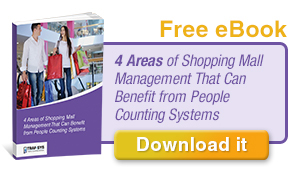 Retailers can utilize people counting systems to optimize their labor. 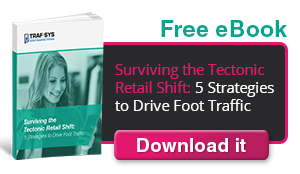 Foot traffic data provides information on peak store hours and busy days, which store owners and managers can then use to schedule the appropriate number of employees, streamlining operations and cutting labor costs. Video-based sensors allow managers to evaluate employee performance, while thermal and infrared sensors can provide insight to conversion and traffic rates for individual sales associates. Organized retail crime and petty shoplifting are major concerns and can considerably impact a retailer’s bottom line. Security cameras are beneficial, but in the past, they haven’t been successful at deterring all shoplifters, as they have blind spots, and managers can’t legally ask to check shoplifters’ bags. However, people counting systems give retailers the right data to keep the sales floor and fitting room fully staffed during vulnerable times, so they can assure that each customer is not only being attended to, but watched by employees. Retailers who analyze foot traffic data are better able to plan for and stock overlooked supplies such as cleaning items, paper towels, and hand soap. Knowing how often your facilities are occupied and how often they require cleaning allows you to appropriately stock these necessary items. 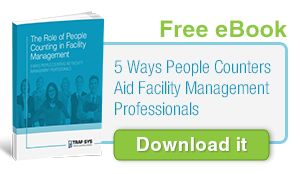 This data gives you a strong understanding of how your building is being used. People counting technology is an increasingly powerful tool for retailers looking to test different marketing strategies, identify showrooming risks and maximize revenue. 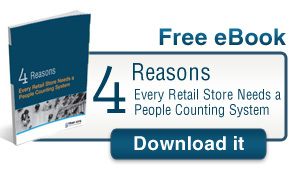 Data analysis from people counters can provide valuable insights that retailers can leverage to improve their business. Available in a variety of forms to suit each retailer’s need, these systems are proving to be critical to retailers looking to stay successful and relevant in such a competitive market.